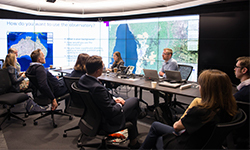 Released this week to stakeholders at RMIT University in Melbourne, the Urban Observatory will enable users to see at a glance how cities, suburbs and neighbourhoods measure up against national liveability indicators. The Urban Observatory is a national database that contains indicators for the liveability domains of walkability, transport, public open space, food environment, alcohol environment, housing affordability, and employment. Users can access the indicators across each of the liveability domains, visualise the indicators within a specific area such as where people live, and compare liveability indicators across major capital cities for different areas. Project technical lead Dr Jonathan Arundel said the Urban Observatory’s unique value is that it is simple and powerful enough to meet the needs of diverse group including policy makers, planners and the general public. “The release of our National Liveability Report last year generated a lot of interest and people wanted access to the data. The Urban Observatory helps us disseminate our findings and achieve research translation,” he said. The Urban Observatory portal is the culmination of seven years of liveability research undertaken by Professor Billie Giles-Corti and her team, with research led by Prevention Centre research fellows Dr Hannah Badland and Dr Suzanne Mavoa. Their research previously developed and validated a set of state and national indicators for liveability in Australian capital cities. The Urban Observatory allows users to compare implementation of state policies across the country, as well as what each state is actually delivering to people to make cities more liveable, based on the national liveability indicators. The findings have been released in a report as well as scorecards for Perth and Sydney, which have achieved widespread media interest. Scorecards for Melbourne and Brisbane will be released in coming months. The Urban Observatory allows different groups to be granted access to information summarised at different levels. For example, planners might need access to indicators at individual household level whereas members of the public might be provided with suburb-level data. “These indicators are just the tip of the iceberg, with future plans to add more measures, for example employment data that will overall provide increasingly detailed information for our users”, said research officer Carl Higgs, one of the portal’s developers. And with several state authorities planning for 20-minute and 30-minute cities, where residents can get to major job hubs and key services within half an hour, policy makers can use the portal to assess whether these targets are being achieved. The Observatory is built on open source software so that other cities worldwide can leverage this pioneering work. Plans for the future include capabilities to visualise trends in indicators across time, allowing users to explore what-if scenarios interactively – that is, making changes to policy settings and seeing how these change predicted outcomes.